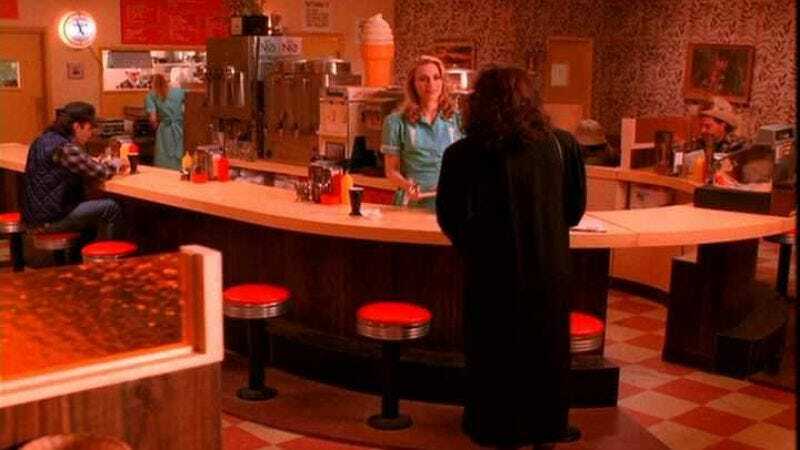 A little over a week ago, we reported that David Lynch had returned to Showtime’s Twin Peaks revival after some kind of financial dispute, and now we have some information on an even more important part of the show that is also coming back: Twede’s Cafe in North Bend, WA, which was used as the show’s famous Double R Diner—known for its reasonably delicious coffee and cherry pie. As The A.V. Club’s own intrepid Pop Pilgrims explained in 2011 when they visited Twede’s Cafe, the interior of the building was destroyed by a fire in 2000, so the owner had to rebuild it without all of that campy-yet-timeless charm that the Double R exuded in Twin Peaks. With all of that hot Showtime money flowing in like so many waterfalls in the Twin Peaks opening credits, though, Twede’s Cafe is going to be restored (de-stored?) back into the Double R Diner so the show—which will be filmed in North Bend, just like before—can shoot there. That news comes from original stars Sherilyn Fenn and Sheryl Lee, who made the announcement while appearing on a Twin Peaks panel during a horror convention in Seattle. They also revealed that series composer Angelo Badalamenti will be creating new music for the show as well, and that the new Twin Peaks series will be 18 episodes long. That’s double what Showtime had originally announced it as, suggesting that the initial episode count is one of the things that made Lynch so reluctant to commit to the revival.